From weather to climate timescales, society needs detailed predictions of the atmosphere, ocean, and land-surface for informed planning. For scientists, a challenge is the ability to accurately initialize high-resolution earth system models (ESMs), particularly where initialization has received relatively less attention and as longer-term information is needed. 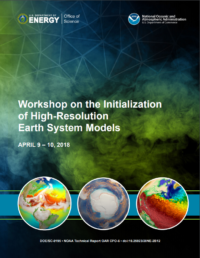 In April 2018, the U.S. Department of Energy (DOE) and National Oceanic and Atmospheric Administration (NOAA) hosted the Workshop on the Initialization of High-Resolution Earth System Models. Read the report here. This workshop, chaired by Todd Ringler of Los Alamos National Laboratory and Steve Penny of the University of Maryland, focused on the opportunities that data assimilation (DA) and, specifically, how coupled data assimilation (CDA) might provide to the ESM enterprise with particular attention toward initialization. According to the summary report, the total body of research surrounding initialization of high-resolution ESMs is not large enough to assert with confidence what research pathways will prove most fruitful. With this “research risk” in mind, CDA is a particularly good choice for focused research activities since CDA can be leveraged by the ESM community to address problems beyond initialization, such as studying the causes of model drift, remedying model biases, and optimizing the use of earth system observational platforms. Continued foundational research on algorithmic approaches to CDA. Continued exploration of the benefits of strongly coupled DA versus weakly coupled or individual-component DA. Implementation of extensible CDA frameworks for use within high-resolution ESMs, such as the DOE Energy Exascale Earth System Model (E3SM) high-resolution configuration. Computational, algorithmic, and middleware solutions to link forward models to CDA system in ESM grand-challenge configurations. Development of testbeds and metrics to measure the fidelity of various initializing approaches. Development of holistic CDA approaches/frameworks that support the diversity of CDA applications. Growth of CDA capability and expertise in the context of E3SM. To learn more, be sure to read the full report.